Christmas • Provo experiment involving Santa, chocolate shows the power of words. Steve Griffin | The Salt Lake Tribune Shayla Brown, 7, and James Good, 6, meet Santa and his elf at VitalSmarts in Provo on Friday. 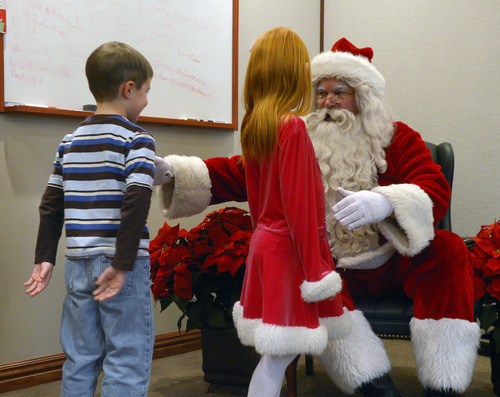 The founder of the Utah company, Joseph Grenny, is running an experiment with kids and Santa. Grenny, coauthor of the NY Times bestselling book "Crucial Conversations," says the study reveals that how we talk about Christmas can have a big impact on how kids approach gifts, giving and gratitude. Good and Brown were part of a control group during the experiment. Here Chase McMillan, of Vital Smarts, explains to the children their role in the experiment. Steve Griffin | The Salt Lake Tribune James Good, 6, and Shayla Brown, 7, meet Santa at VitalSmarts in Provo Friday, December 20, 2013. The founder of the Utah company, Joseph Grenny, is running an experiment with kids and Santa. Grenny, coauthor of the NY Times bestselling book "Crucial Conversations," says the study reveals that how we talk about Christmas can have a big impact on how kids approach gifts, giving and gratitude. Good and Brown were part of a control group during the experiment. Here Chase McMillan, of Vital Smarts, explains to the children their role in the experiment. Steve Griffin | The Salt Lake Tribune James Good, 6, and Shayla Brown, 7, meet Santa and his elf at VitalSmarts in Provo Friday, December 20, 2013. 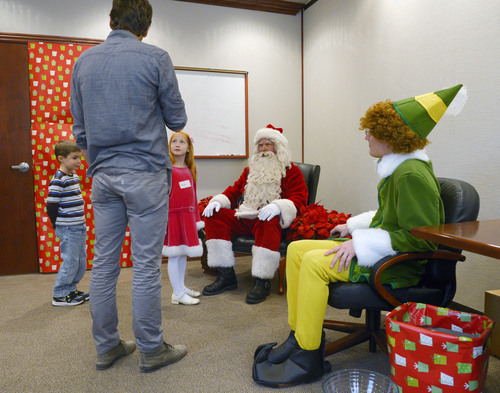 The founder of the Utah company, Joseph Grenny, is running an experiment with kids and Santa. Grenny, coauthor of the NY Times bestselling book "Crucial Conversations," says the study reveals that how we talk about Christmas can have a big impact on how kids approach gifts, giving and gratitude. Good and Brown were part of a control group during the experiment. Here Chase McMillan, of Vital Smarts, explains to the children their role in the experiment. Steve Griffin | The Salt Lake Tribune James Good, 6, and Shayla Brown, 7, meet Santa at VitalSmarts in Provo Friday, December 20, 2013. 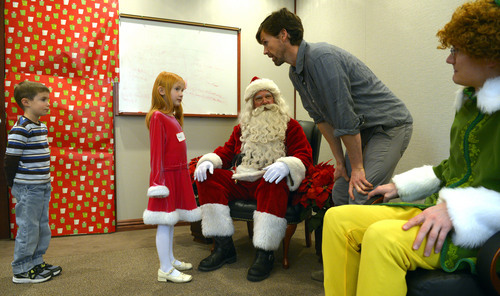 The founder of the Utah company, Joseph Grenny, is running an experiment with kids and Santa. Grenny, coauthor of the NY Times bestselling book "Crucial Conversations," says the study reveals that how we talk about Christmas can have a big impact on how kids approach gifts, giving and gratitude. Good and Brown were part of a control group during the experiment. Steve Griffin | The Salt Lake Tribune James Good, 6, and Shayla Brown, 7, meet Santa at VitalSmarts in Provo Friday, December 20, 2013. The founder of the Utah company, Joseph Grenny, is running an experiment with kids and Santa. Grenny, coauthor of the NY Times bestselling book "Crucial Conversations," says the study reveals that how we talk about Christmas can have a big impact on how kids approach gifts, giving and gratitude. Good and Brown were part of a control group during the experiment. Here Chase McMillan, of Vital Smarts, explains to the children their role in the experiment. 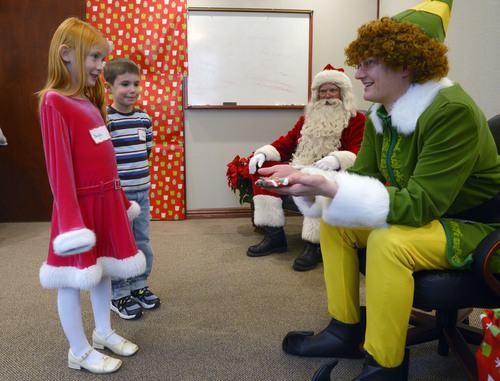 Steve Griffin | The Salt Lake Tribune Kayden Carter, 6, enjoys a piece of chocolate after meeting Santa and his elf at VitalSmarts in Provo on Friday. 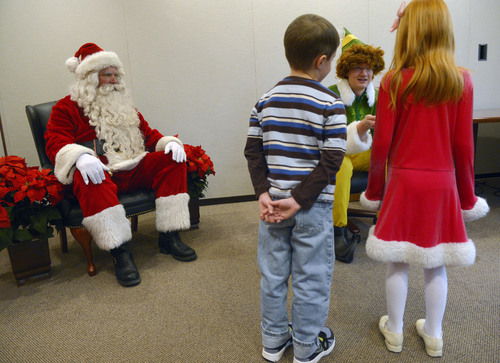 The founder of the Utah company, Joseph Grenny, is running an experiment with kids and Santa. Grenny, coauthor of the NY Times bestselling book "Crucial Conversations," says the study reveals that how we talk about Christmas can have a big impact on how kids approach gifts, giving and gratitude. Provo • Parents who fret that Christmas is far too commercial should heed the results of an experiment that ended in Provo on Friday. It&apos;s all about how adults  including Santa  talk about gift giving and getting, the study by the company VitalSmarts indicates. In two days of experiments, there was a 15 percentage point increase in children&apos;s impulse to be generous after they heard Santa frame Christmas as a time for gift giving. "The implications are pretty big," said Joseph Grenny, co-founder of VitalSmarts, a Provo management consulting company that teaches businesses worldwide. "If parents are only talking to their children from the time they can verbalize about &apos;get, get, get&apos; for Christmas, that&apos;s where the commercialization is coming from." VitalSmarts will publish the results of its research, which included 37 children earlier in December and 20 on Friday, and the results likely will make it into a future book. The company&apos;s executives have co-authored four New York Times bestsellers, including "Crucial Conversations" and "Influencer." The company also will likely make a video to post on its YouTube channel, as it has for other experiments, including one about getting children to wash their hands. While the importance of "framing" has long been understood in social science, this experiment among children demonstrates that it&apos;s at work for children just as it is for adults, he said. The truth is we&apos;re not so different from 5-year-olds. We all respond to frames," Grenny said. 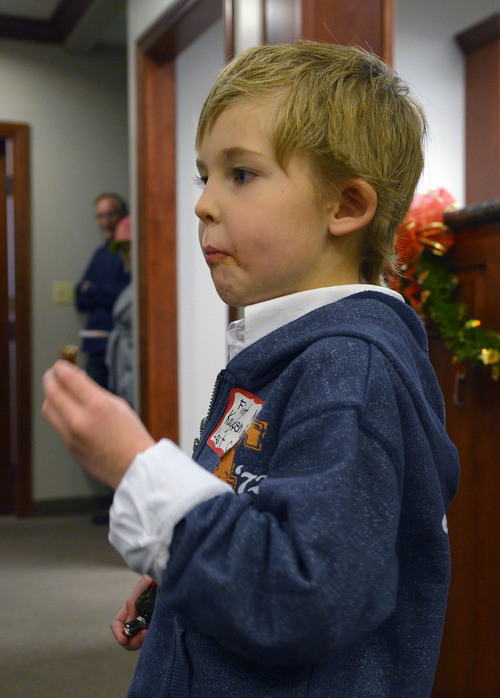 Choices • VitalSmarts employees invited acquaintances and Facebook friends to bring their children to the company&apos;s office for a Christmas party. The children, generally ages 5 to 8, munched on grapes, pretzels and apples and played games as they waited their turn to sit on Santa&apos;s lap in the next room. Santa worked from two scripts: some children got the traditional what-do-you-want spiel and others heard Santa tell about the joy of giving and ask what gift the child planned to give this Christmas. Whether Santa&apos;s words had an effect was measured by the child&apos;s choice to take the smaller or larger reward  chocolate bears  for himself, leaving the other to a second child who also was in the room. Chase McMillan, research and development manager for VitalSmarts, said that 30 percent of the children chose the smaller chocolate bear for themselves even after hearing Santa ask about what gifts they want to receive. But those children who heard Santa extol gift-giving chose the smaller bear 45 percent of the time. Power of words • Megan Johnson, 9, said she was a bit surprised to hear Santa talk about giving rather than getting. But she also didn&apos;t think he swayed her choice to take the smaller bear for herself and let Shayla Brown, 7, of Spanish Fork, have the larger one. "Someone else was with me and she was younger than me and so she should have the bigger one," Johnson, of Orem, said. Kayden Carter, 6, of Santaquin, used the opposite logic. He gave the boy in the experiment with him, James Good, the larger bear because he was older. "James is 7 so he gets the big one and I&apos;m 6, so I get the small one," he said. "He&apos;s really big into fairness," said his mother, Jesomie Carter. Kayden&apos;s mom said the family tries to downplay want-for-Christmas lists. "We get excited about gifts and how to make them special for others." Grenny said the experiment shows parents the power of words go far beyond Christmas. "Do we talk about chores or do we talk about sharing responsibilities at home? Do we talk about getting homework done or do we talk about learning?" Parents often make discipline self-serving, "about violating my authority," when it ought to be about the hurt inflicted by misbehavior, Grenny said. "Those small language changes profoundly affect how a child feels ... and whether they become moral or obedient."